I got my first lesson in the fine art of jigging for salmon in the early eighties, and it’s a technique that has helped me put a lot of fish, especially Chinook, in the fish box ever since. And I’m not alone. British Columbia anglers have been catching salmon on them for a long time, and about 35 years ago Washington salmon fishermen began to figure it out, with equally good results. 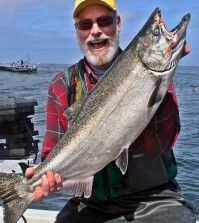 Oregon anglers eventually caught on, and now jigging is a fairly well-accepted salmon-fishing technique as far south as the northern California coast. 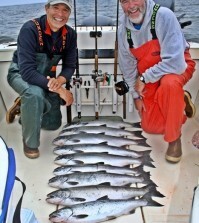 It’s easy to understand the growth of the jig fishery for salmon. Most importantly, jigs work! These little slabs of metal are the approximate size and shape of the herring, anchovies and other small baitfish on which Chinook, coho and other Pacific salmon feed, so if you put a jig in front of a hungry salmon, it’s likely to take it for an easy meal. A couple of metal jigs cost about the same as three or four dozen herring, but will last a lot longer, and without the mess or smell of fishing with bait. In areas where spiny dogfish are a problem, jigs reduce–but don’t completely eliminate–the problem of dealing with pesky sharks. 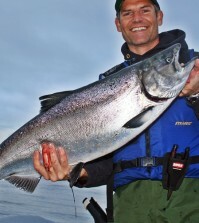 Jigging is especially well-suited to fishing for Chinook salmon, kings of the Pacific. Chinook often congregate where baitfish are plentiful and around certain kinds of bottom contours, near-shore structure or in estuaries before ascending their home streams to spawn. Locate these king salmon concentrations with your depth sounder, drop a jig straight down to them and hang on. Kings can often be teased into striking a jig when other methods fail. Summer kings, whether in the ocean, our inside marine waters, or even river-mouth estuaries, often congregate in specific spots. Sometimes those fish concentrations are focusing on baitfish, sometimes they’re lined up along current lines or structure breaks, sometimes (especially in estuaries) they’re just piling up in a deep hole, waiting for the next tide to draw them upriver. Whatever their reason for being there, these concentrations of fish are perfect targets for jiggers, who can hold above them, fish their jigs straight down below the boat, even watch both fish and jig on their depth sounder screen, and work the lure until one fish can’t stand it any long and inhales the jig. Just because they’re concentrated in a relatively small area, though, doesn’t necessarily make a summer Chinook a sucker for any jig you dangle in its face. If they’re feeding on a particular baitfish, you may have to steal a strategy from the fly fishermen and “match the hatch.” If they’re on three-inch anchovies, go with a smaller, slimmer jig; if seven-inch herring appear to be the main course, upsize your jig accordingly. Likewise, if those baitfish appear to be occupying a particular depth range, try to keep your jig working at or just below that range. If they’re on or near the bottom, don’t be afraid to bounce your jig right down there in the sand and gravel. Kicking up a little dirt and making some noise with your jig just might draw a nosey king in for a closer look. In these days of tighter salmon-fishing regulations in many areas, by the way, jigs make catch-and-release fishing a lot easier. Salmon rarely swallow a jig, so the vast majority of fish are hooked in the jaw, where they can be easily unhooked and released. While Pacific salmon, especially Chinooks, can be very vulnerable to a well-fished jig, some anglers have been slow to accept this relatively new fishing method. Many give it a try or two, fail to figure the basics of good jigging, and go back to trolling or mooching. 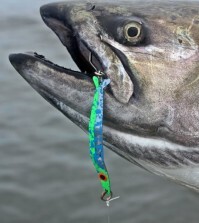 But with a little patience and a day of jigging practice, anglers who learn the keys to jigging success soon discover that this is one of the deadliest salmon-fishing techniques of them all. First and foremost, whether you’re after summer kings, winter blackmouth or fall coho, the jig has to move. Even with its finely molded form, realistic finish and lifelike detail, a metal jig simply hanging there at the end of the line doesn’t look like food to a salmon. Bait, with its natural scent, might draw fish while it’s lying more or less stationary, but a metal jig hanging vertically in the water looks to a salmon like a, well, a piece of metal hanging in the water. Move it, though, and it comes to life, and salmon respond accordingly. Successful jiggers stay active, constantly twitching the rod tip, lifting and dropping the rod, reeling and free-spooling line, so that the lure continually “swims” toward the surface and falls back again, resembling the spastic gyrations of an injured or disoriented baitfish. A crippled anchovy, herring or candlefish is an easy mark for a hungry salmon, and that’s what a jig looks like if you keep it moving up and down through the water column. A metal jig is at its fish-catching best when it’s dropping through the water, not when it’s being lifted toward the surface, so it’s important to let the lure drop as freely as possible. When all tension is released, metal jigs flatten out into a horizontal posture, where they vibrate, wobble and dart erratically as they plummet toward bottom. If you keep tension on the line during the drop, the lure remains vertical and virtually lifeless, so it’s very important to “throw some slack” on the downward part of the jigging stroke. If you give the jig a chance to dance when it’s falling, it’ll attract feeding salmon like a dinner bell. Likewise, allow the jig to free-fall as you’re dropping it to the desired depth. Depending on what your depth sounder is telling you about the location of feeding fish, you may want to free-spool the lure all the way down to the desired depth, or, if the fish are scattered, stop it every six or eight feet, giving salmon a chance to hit it before continuing the lure’s descent. Whichever way you go, allow the lure to drop rapidly on as slack a line as you can control. Since the jig is most active as it’s dropping, that’s when most salmon strike. Unfortunately, these slack-line strikes are among the most difficult in fishing to detect and react to. What that means is that the jigger has to be alert and ready to react at all times. If you feel a “tick” on the line as the lure falls, reel down fast and set the hook hard. If the line goes slack, indicating the lure isn’t falling anymore, reel down fast and set the hook hard. If the line angle changes…well, you get the picture. Any of these subtle changes in line tension or direction means a salmon has intercepted the jig on its way down, and when it realizes that it has a mouthful of metal instead of a mouthful of meat, it will start trying to get rid of the bogus meal almost immediately. If you don’t react quickly with a hook-set, you’ll be too late. Your choice of rod, reel and line will play a big part in your jigging success. Pick a rod that’s long and stiff enough to lift and drop your jig when you lift and drop your arm. It sounds simple enough, but many anglers start jigging with a rod that’s way too limber, like their downrigger rod, so that when they flail up and down with their arms, trying to work the jig up and down, the soft rod absorbs all the energy, flexing and straightening while the jig remains motionless. A stiffer rod of at least 7 ½ feet also gives you more leverage when the time comes to set the hook on a salmon that may be down there 100 feet or more. As for a reel, most jiggers prefer revolving-spool models over spinning reels because of the line control they afford. You can quickly clamp down with your thumb on the spool of a revolving-spool reel when you have to set the hook in a hurry, while with most spinning reels you have to engage the bail to gain line tension and set the hook. That takes time, and will cost you hook-ups on salmon notorious for grabbing a lure as it falls on a slack line. Your choice of line also is critical to jigging success. Just like a limber rod, a stretchy line will absorb lots of energy and keep you from lifting and dropping the jig effectively. Line stretch is also a problem in getting a good hook-set in deeper water. For those reasons, most jiggers have switched to the high-tech braided lines for much of their salmon jigging. These low-stretch lines let you move your lure up and down with less effort, set the hook better, and offer the added advantage of small diameter and therefore less line drag in the water. Because even the most stupid salmon realizes its mistake the second it chomps down on a metal jig and starts immediately trying to spit out its mistake, needle-sharp hooks are a must. If you keep hook points sticky-sharp, they’ll penetrate that fraction of an inch that will keep them in contact with fish flesh until you can get around to burying the barb for keeps. Salmon will use the weight of the jig to help shake a dull hook in less time than it takes to tell about it. Carry a good hook file and use it every time you bring a jig to the surface. Here in Washington, all salmon hooks must be single hooks, which is fine, because single hooks work better on jigs than trebles do anyway. There’s no such thing as the perfect metal jig for all conditions, so carry a selection of sizes and change as the situation dictates. These lures should be fished pretty much straight up and down for best results, and you’ll need a heavier jig to get straight down when the wind or current is moving you along at a good clip. On the other hand, if you go to a smaller diameter line or as the water calms, you may reach greater depths with lighter jigs. A lighter lure is generally more active, so you should use as light a jig as you can get away with, as long as it will reach the desired depth and maintain a vertical line angle. Just as you should go to lighter or heavier jigs depending on conditions, you should also change your jigging stroke according to changing conditions. You will, for example, need a longer jigging stroke to breathe life into a jig that’s 150 feet below the surface, but if you use that same stroke in only 40 feet of water, you’ll probably be moving the lure too much, and may actually be pulling it away from interested salmon. Shorten the stroke as you fish closer to the surface, and always be willing to experiment if your “normal” jigging motion isn’t paying off. 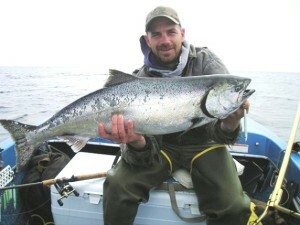 There are simply times when salmon want the lure moving faster, slower, farther or not so far. Terry Rudnick is a freelance outdoor writer and photographer specializing in Pacific Northwest hunting, fishing, and boating. He is the author of the seminal volume "Washington Fishing," and co-author of the award-winning books "How to Catch Trophy Halibut" and "Washington Boating and Water Sports." Rudnick has received more than two-dozen awards for his writing and photography, including the Silver Trout Award and the Ken McLeod Journalism Award.